The TS-100 has been deployed for three years on a weather station at a record-setting cold location in the contiguous United States - Peter Sinks, Utah with the same fan running continuously. 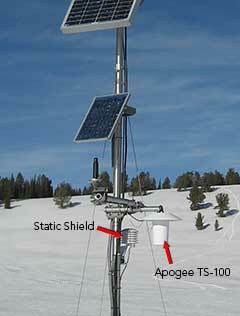 It is used to accurately measure the extremely cold air temperatures that occur at the site. The Peter Sinks site uses two yellow-bead thermistors and two PRTs in an Apogee TS-100 to make replicate measurements. Note the Apogee SP-230 all-season pyranometer in the picture as well. View live Peter Sinks data.